DM expresses satisfaction at destruction of the 'longest and deepest tunnel ever uncovered'; added call to Gaza residents under Hamas rule. Defense Minister Avigdor Liberman today welcomed the destruction of the terrorist tunnel at Jabaliya, which he described as "the longest and deepest ever exposed." The tunnel began several kilometers inside Gaza and was part of an entire network of tunnels there. The army says that the entire tunnel system is to be completely thwarted by the end of the year. "We open the week with impressive intelligence and operational achievements, with the destruction of another terrorist tunnel, the longest and deepest one ever uncovered," Liberman tweeted on Twitter. "Residents of Gaza: Hamas is burning your money on tunnels leading nowhere. We'll catch them all," Liberman concluded. 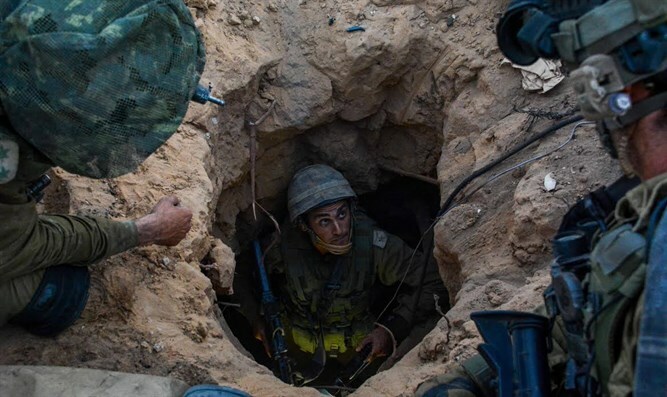 Transportation and Intelligence Minister Yisrael Katz joined in congratulating the IDF on the discovery and explosion of another Hamas terrorist tunnel that penetrated Israeli territory opposite the Jabaliya camp, the first penetrating tunnel to be exposed and exploded in the northern sector of Gaza since Operation Protective Edge. The tunnel threat is about to end, and we'll continue removing threats against Israel in every sector and by any entity."